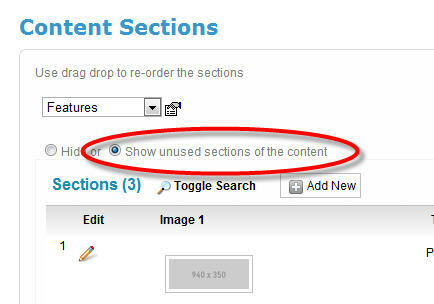 When editing a content section, usually it is setup to only allow you to edit information that has already been specified in the specific record. This is so that fields not required for the specific record are not displayed since they will not be used by the plugin used to display the information. Background: A Content section record actually has numerous entry fields, but several fields may not be used for the specific record you are editing. After making your edits, you can click the "Hide" radio button to again prevent unused fields from being displayed.